Fury 325 is an excellent roller coaster in Thrill Zone and one of the best attractions at Carowinds. The minimum height to ride is 54 inches. Billed the world's tallest and fastest giga coaster, this Bolliger & Mabillard giga model opened too the press on March 25, 2015. The coaster takes riders up 325-foot, 81-degree lift on a course that includes 6,602 feet of track (more than a mile) and a top speed of 95 miles per hour. 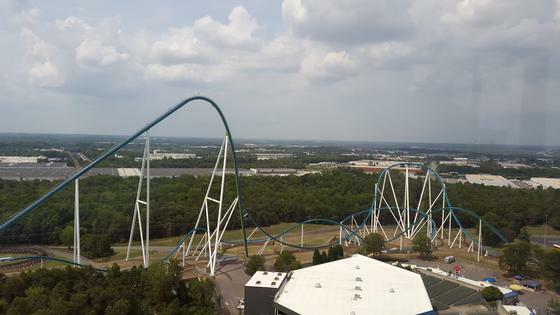 The newest giga coaster in the United States is Fury 325, and it is a completely different beast than either Millennium Force or Intimidator 305. It has a very fast, intense first half which sort of combines the experiences of Force and I305 (without the "gray-out" g-forces of I305), but ends with three weightless, airtime hills to complete the course. The Rao family loves Fury 325. In fact, most of the family considers it to be the best coaster they have ever ridden (although I am still partial to Maverick at Cedar Point). Excellent! The blistering speed alone makes this worth experiencing. It's a wild ride with nice elements and plenty of airtime. Every time I ride it I feel as if I'm caught in a tornado or a cyclone.